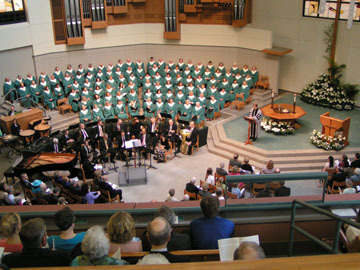 Members of the choir traveled overseas in 1997, 2001, 2004, and 2007 in short term “music missions” which brought the Word to small churches and communities in the Czech Republic, Hungary, Slovakia, Italy, Slovenia, Croatia, Russia, Germany and Poland. You can hear the choir on the CDs Blessings; Fount of Every Blessing; and Songs of the Spirit. For more information about the music program at FPCB, see BelPres.org Music. To hear and see the Chancel Choir singing, select the links in the side-panel on the right.